The Volkswagen Beetle is arguably one of the most famous cars of all time. The production of the iconic car began in 1938 and ended in 2003, with more than 21 million units built. The iconic “Bug” is loved by people all around the globe. As the first model built by Volkswagen, it was designed by Ferdinand Porsche as a car affordable for everyone. The last car was produced in Mexico in 2003 and was directly delivered to the VW museum in Wolfsburg, Germany. Over the course of its production, many owners have customized and created unique examples of this great car, but perhaps none is as unique or extraordinary as the Vochol, a Beetle decorated with more than 2 million glass beads. 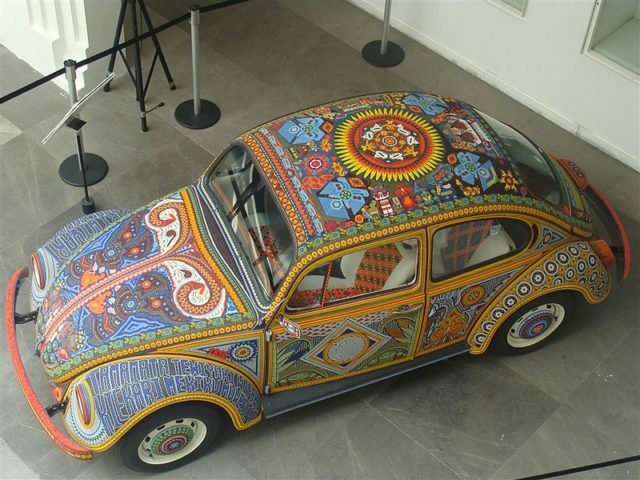 The name Vochol is a combination of “vocho”, a term used for the Beetle in Mexico, and “Huichol” the name of an indigenous group of people. 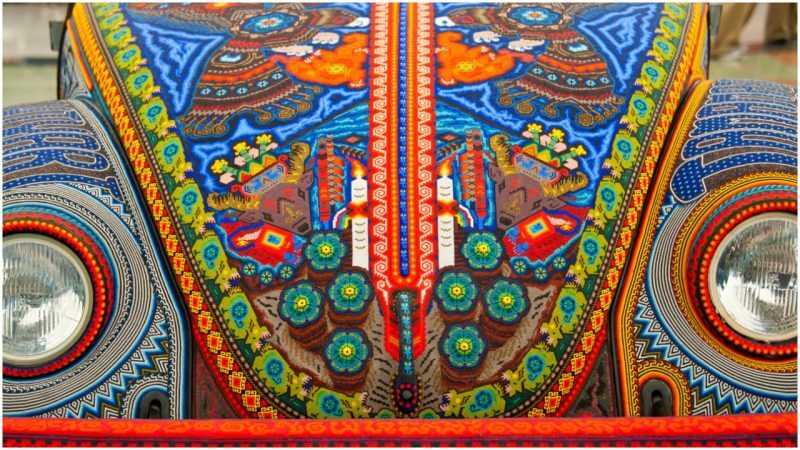 The Huichol are Native Mexicans famous for their unique and colorful art pieces, made with yarn, seeds, and beads. 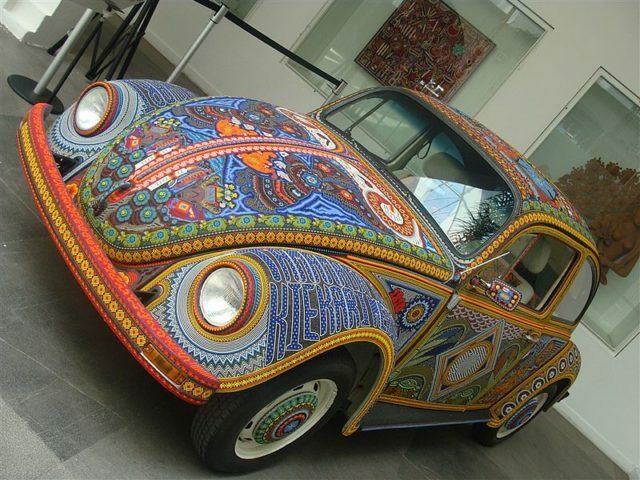 In 2010, Huichol artisans were given the task of decorating a VW Beetle in their traditional style. The project was funded by various organizations with the sole purpose of creating a piece of art which would promote the Huichol culture and their artistic skills. In the past, the artisans from the indigenous group used to decorate masks, jaguar head figures, bull horns and other items, using seeds as the prime material. Nowadays, the seeds are replaced with materials like ceramics, glass, metal, and stone. The materials are kept in place with a type of wax made in the Mexican state of Campeche. Eight artisans from two Huichol families were employed for the project. The craftsmen worked for more than 7 months, beginning in May 2010 and changed location several times. The final touches were done at the Muse de Arte Popular in Mexico City. After 4,760 hours of work and 2,277,000 beads used, the Vochol was completed. The artisans used nearly 200 pounds of beads, affixed with 35 pounds of resin. 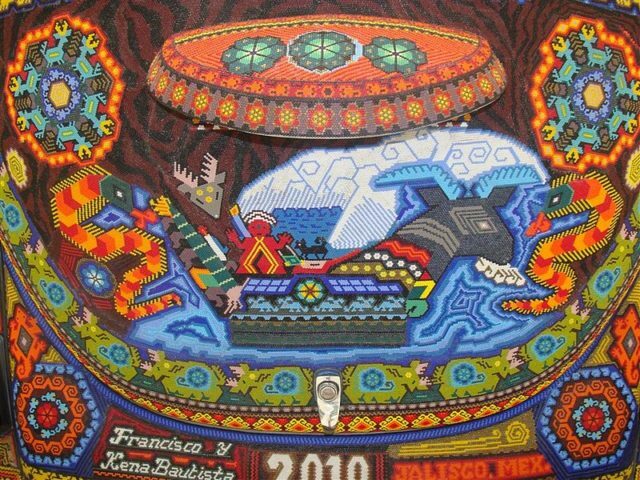 The images on the car represent the Huichol culture. The sides of the car were decorated with images of important items from the Huichol history, like fire, corn, sun, peyote, and deer. The back was painted with drawings of offerings and a shaman steering a canoe. The roof has an image of a large sun and four eagles, representing the union between men and the gods. The hood contains images of two snakes above clouds, which represent rain. The Eye of God was also painted on the car as a figure with five points, with the center representing the source of life, and the remaining four points representing light, strength, knowledge, history, agriculture and the present time, respectively. The phrases “100 years since the Mexican Revolution” and “200 years of Independence” are written on the front fenders of the Beetle in the native Huichol language. When the project was completed, the car was presented at the eight edition of the Zona MACO exhibition, in December 2010. The unveiling was done in Guadalajara by Consuelo Saizar, the president of the National Council of Culture and Arts. 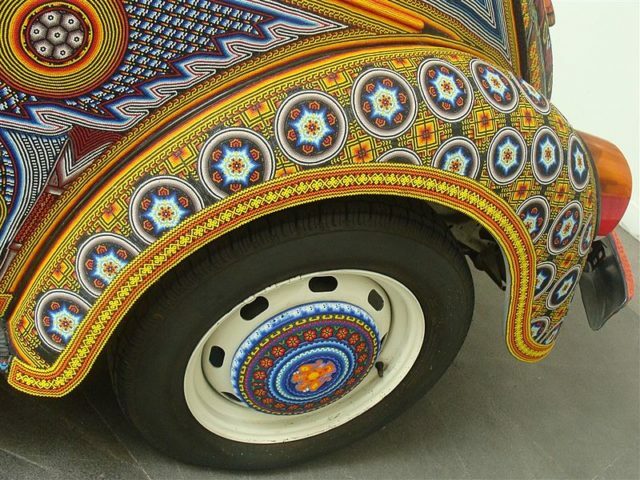 Since then, the Vochol has traveled the globe, representing Huichol culture around the world.